The minders probably won’t let me run away with Imelda May, but if I can figure out a way to do it, I will. King John’s Castle is probably the ideal place, since I can dress up as Erroll Flynn and swing from a chandelier to abduct my favourite temptress, while at the same time skewering a couple of henchmen with my trusty rapier. I’ll leap over the ramparts into the waters of the mighty Shannon and laugh at the Sheriff of Nottingham as he grinds his teeth and twiddles his evil moustache. Go back to Nottingham, I’ll shout at him. That should quieten him. I bet he’ll have no answer to that. En garde! he’ll snarl, waving a little sword, but it will be too late as I bear my fair maiden downriver in a waiting boat crewed by fearless comrades. We’ll repair to my castle where gentle maidens have prepared a bed of damask and silk for my sweet Imelda, but naturally, I’ll be a perfect gentleman. Imelda will learn to care for me in time I’m sure but if not, at least I’ll have saved her from the clutches of evil sheriffs — especially those from Nottingham. I can’t wait to hear my heroine in the grounds of an 800-year-old castle. Does it get better? Where every area is a VIP area. Where the security wear chain mail and carry maces. A place where no Norman sheriff will ever threaten our beloved Imelda, lest he feel the taste of cold steel. 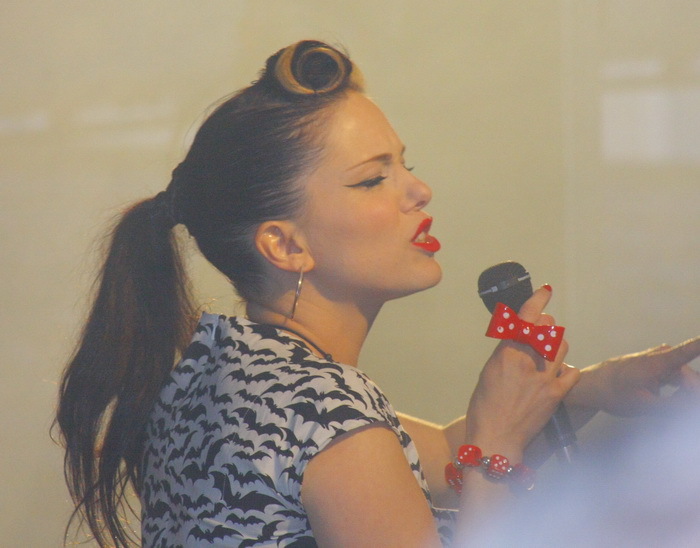 Let’s hear it for Imelda May, the coolest, sassiest, psychobilliest performer ever. your photo is out of date Bock……………..
saw her with Damien Dempsey in Galway 2 weeks ago, didn’t recognise her with the new Barnet when she walked out on stage. very different, but you wont be disappointed. an outstanding show from start to finish. I’m using my own photos. When I go to the castle I’ll take more up-to-date pictures. Or is that green? Either way..!